David is an extremely accomplished litigator. He works at a prominent firm in New York City and recently expanded his resume to include teaching. I applaud his efforts on behalf of these law students—people like David, teachers, make the world a better place. I’m sure your students have no idea how hard you’ve been working, planning lessons tirelessly since October and commuting to North Carolina weekly. And you maintain your position as a full time lawyer and leader in your firm. I thought I had a full schedule! 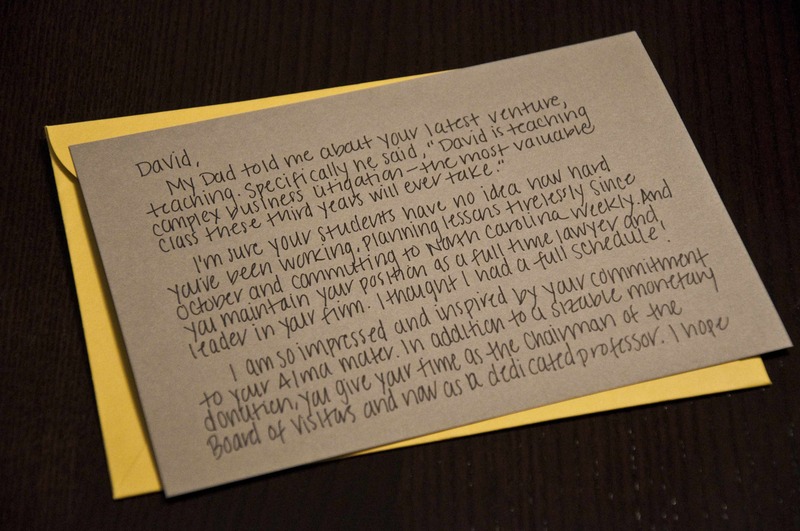 I am so impressed and inspired by your commitment to your Alma mater. In addition to a sizable monetary donation, you give your time as the Chairman of the Board of Visitors and as a dedicated professor. I hope those student know how very lucky they are. Best of luck completing the semester. You’re in the home stretch now. And I bet your wife is looking forward to your summer vacation.